Cleveland Motor Car Company was started in the early 1900’s by E. J. Pennington in Cleveland, Ohio. Certainly not to be confused with the Cleveland Automobile Company started by F.C. Chandler in 1919–the two companies are not related. It is not clear to me when he actually built his cars, maybe 1903-1908 (?). 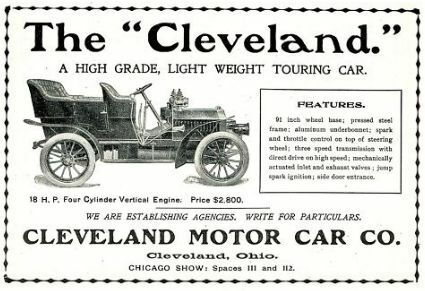 Above is the 1907 Cleveland and below is the 1905 Cleveland ad. I have seen many conflicting reports each stated with confidence, so I have used dates that have been published in periodicals of the time and advertisements. Very few cars were advertised that were not built such as the Davis, advertised from 1930-1932 in hopes of re-opening the factory that had been foreclosed. Before the Cleveland Motor Car Company, E.J. Pennington built The Tractobile from 1900-1902 in Carlisle, PA. 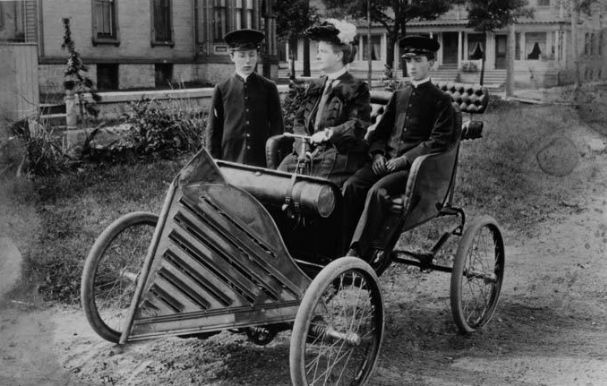 The steam-powered device could be attached to any horse drawn carriage to make it into an automobile. The steam motor was connected to a removable frame built between two bicycle wheels with a tiller connected to the right wheel. The Tractobile advertisements used an acrostic for Steam Engine. Simple, Trusty, Economical, Ample power, Mechanical, Efficient, Noiseless, Gearless, Interchangeable, No complications, Exhaust invisible. The Tractobile sold for $450.00 by itself, or a complete car could be ordered for $625.00 ($650.00 with rubber tires). There is a photo below. When estimating production numbers for automobiles in the New Year, the January 7,1904 issue of Motor Age stated, “A new and unknown quantity in the local field is the Cleveland Motor Co., a concern headed by E. J. Pennington.” In the same issue it was reported that “Only one Cleveland retailer failed last season”. This is why I used 1903 for a start date. That seems to fit with the discontinued idea of the steam engine device as well. The ad at the top is a 1905 Cleveland model. 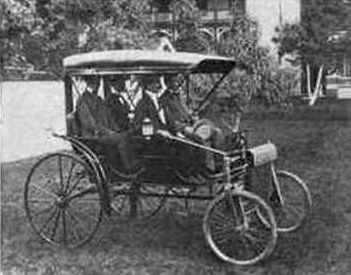 Motorized baby carriages were also mentioned as one of the ideas Pennington had in other publications. E. J. Pennington certainly had a history of coming up with ideas to make money that didn’t work out, and cost his investors a great deal of money. The New York Times reported June 28th 1904 that E.J. Pennington was arrested for fraud at the St. Louis World’s Fair. After his death on March 10, 1911 the New York Times article Claimed his life was out of the adventures of the get-rich-quick variety. It also stated he was married again hours after his wife was buried. 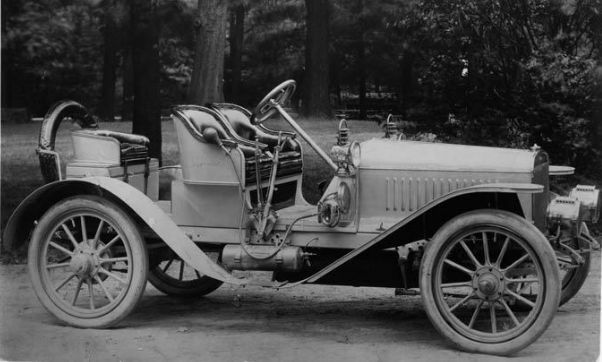 Horseless Age January 1908 said “the Cleveland Motor Car Company began making important changes in its organization. It disposed of its factory in Cleveland, and made arrangements to build a new factory at Milwaukee. Early last summer At the same time the main office and sales department were removed from Cleveland to 1659 Broadway, New York, where all the business of the company is now transacted. The company decided to build 300 cars during the coming year, and to dispose of its product entirely through branch offices.” Below is a scan of the specifications for the Cleveland out of a book with all the vehicle specifications for all cars and trucks sold in the United States in 1907. I have found no other mentions of a Cleveland factory in WI, so I have used the 1908 for an end of production. By 1913 there was a tire store located in the NY office address listed earlier.